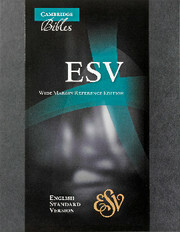 This is a Cambridge ESV Wide-Margin Reference Bible, bound in calf split leather. 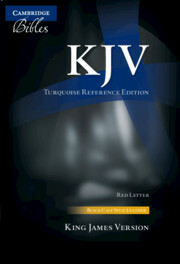 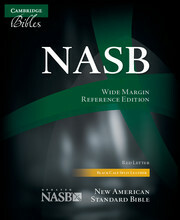 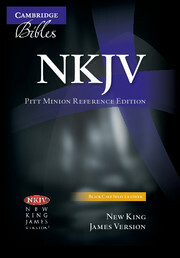 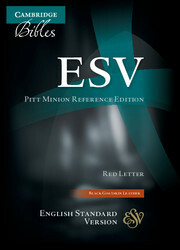 The Wide-Margin edition is an enlargement of the ESV Pitt Minion Edition and the text is arranged in paragraph format, with full cross-references and with the words of Christ printed in red. 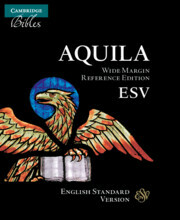 It is typeset in a modern digital font, with a traditional look, that performs the essential task of including many words within a moderate page extent so as to keep the Bible to a manageable size. 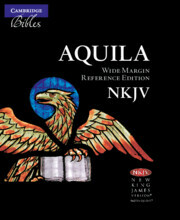 Like other Cambridge wide-margin Bibles in modern translations, it has generous wide margins around the text and an extensive concordance. 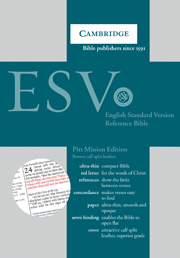 This Bible is printed on resilient Bible paper that stands up well to note-taking, gilt edges and is bound in black calf split leather with two ribbon markers. 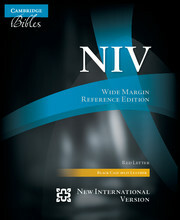 Like all Cambridge Bibles, it has a fully sewn binding for durability and ease of use.